Here is another testing result that represents a very troubling trend. Since the tsunamis in 2016 that ravaged both Vanuatu and Fiji, there has been a much higher incidence of contamination in the Kava that we’re seeing coming into the United States. With so much flooding, and poor dispersal and sewage systems in these small island countries, there is a lot of room for all kinds of nastiness to get into the roots of Kava plants. And, since the edible part of the Kava plant are the roots, it’s even more vulnerable to mold and fungus, as well as E. coli, Staphylococcus, and several other pathogens that are harmful to humans. WE don’t present this information to be alarmist, or to drum up new business. We truly want to help you provide safer products to your consumers. The easiest way to assure that is to get your products tested, as is required by the FDA anyway. It’s shocking how many materials we’ve tested that have come up positive for E. coli or Staphylococcus. Both are harmful to humans, and although in most cases, the symptoms of each pass on their own, any contaminant in any product offered to the general public should be of great concern. In Kava, since it’s a root, there naturally occurs a much larger amount of mold, with a much larger aerobic plate count than plants that use the stems, leaves, or flowers for consumption. Roots live underground, are constantly damp, never get any light, and are amazing breeding grounds for all kinds of bacteria. That’s enough to content with without the added danger of sewer runoff, tainted irrigation water, or a bevy of other problems that can get into the Kava produced on islands or in emerging nations. It’s a very small price to pay to be one step closer to FDA compliance, while building trust in your consumers. 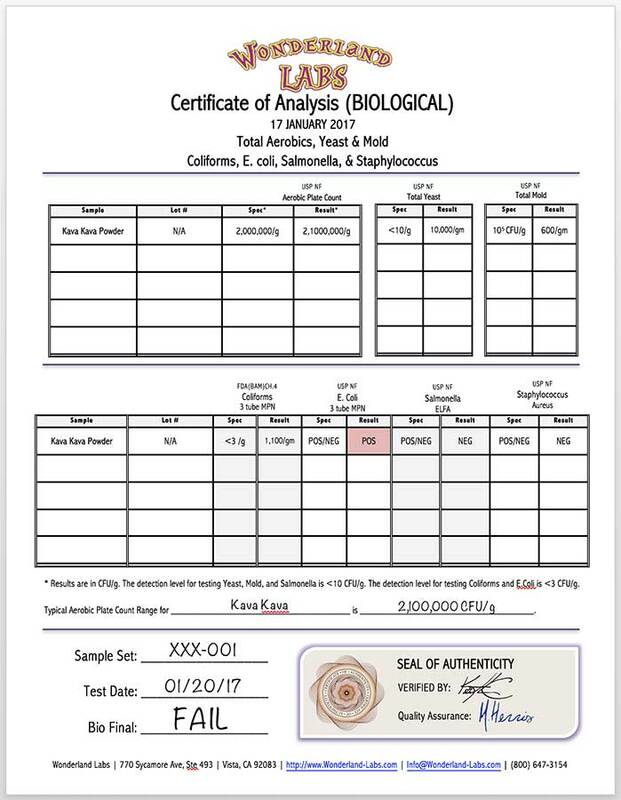 For those who are thinking on making large wholesale purchases from suppliers, lab testing of Kava is an even smaller price to pay for this kind of insurance. We like to think it’s an honest world, but I can’t count the number of times we’ve been sent samples labeled “Kratom” or “Kava”, only to run an identity test and find out they’re something completely different. As an example for Kava, we were sent a sample that was called “Kavalactone 30% Powder”. When we tested it, it came up as about 5% Kavalactone, and about 95% maltodextrin. There were no pathogens in the product, but if someone would have purchased 100kg of this product, you can see the great loss they would have taken. Another example is with Kratom. Someone was about to make a large purchase in the metric tons of Kratom powder called “Green Maeng da”. 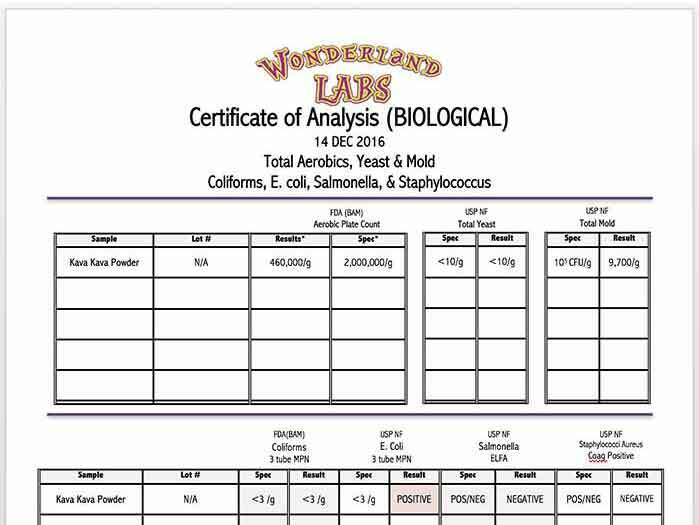 They sent us a sample for testing, and it came up positive for E. coli. Without telling us at the time, another sample arrived from this company a week later labeled “White Maeng da”. Oddly enough, the fingerprint for this sample looked identical to the fingerprint for the “Green Maeng da”, and it also came up positive for E. coli. We realized that the manufacturer didn’t want to believe the results (it’s rare that Kratom comes up positive for pathogens as dangerous as E. coli), but they were grateful to us once they got the results. Feel free to give us a call and discuss your needs. We are usually booked solid, but can still get emergencies in same day, with turnaround times limited only by incubation periods. Before you make your next big purchase, send some material to us, and ensure that you’re not only buying genuine, unadulterated product that’s safe for your consumers, but receive a stamped, signed and embossed Certificate of Analysis that you can share with your consumers to build trust in your brand and your products.